Statto's Movie Review Site - A Knight's Tale Review. A Knight's Tale (2001), Cert PG. Starring - Heath Ledger, Rufus Sewell, Shannyn Sossamon, Paul Bettany, Laura Fraser, Mark Addy & Alan Tudyk. Premise - When a knight is found dead before the final round of a joust, his squire, William (Heath Ledger), picks up the lance and discovers he has a natural aptitude for the sport. He decides to impersonate a Knight and compete in various jousting tournaments to make some money. However, when he meets Jocelyn (Shannyn Sossamon) he begins to seek her more than fortune. 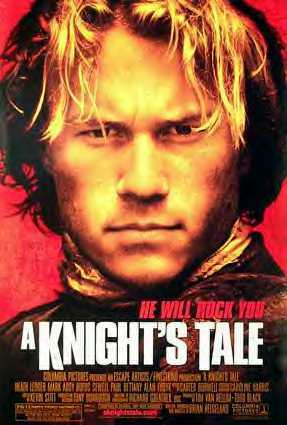 A Knight's Tale is about as predictable a film as I have seen in a long, long time. It unashamedly wears it's 'kid from the wrong side of the tracks pulls it off' name badge for all to see. It's 'Rocky', it's 'The Karate Kid' and it doesn't seem to care. You get the feeling the audience would care however as we have seen everything that A Knight's Tale has to offer many times before. Well, that's not strictly true. A Knight's Tale does bring something new to the plate. Whilst for the most part the film is set in days of 'yore', the soundtrack suggests otherwise. Peppered throughout the film are classic seventies rock anthems from the likes of David Bowie and Queen. It gives the film a hint of uniqueness that the cliched plot could never hope to deliver. In saying that though director Brian Helgeland (Who also made the Mel Gibson flick Payback, worth a look!) doesn't seem too confident in this gimmick and practically abandon's the idea around halfway through the films (lengthy) running time. He handles the rest of the film fairly unevenly. The jousting scenes are very well handled with swooping camera's and slow motion lance shattering. 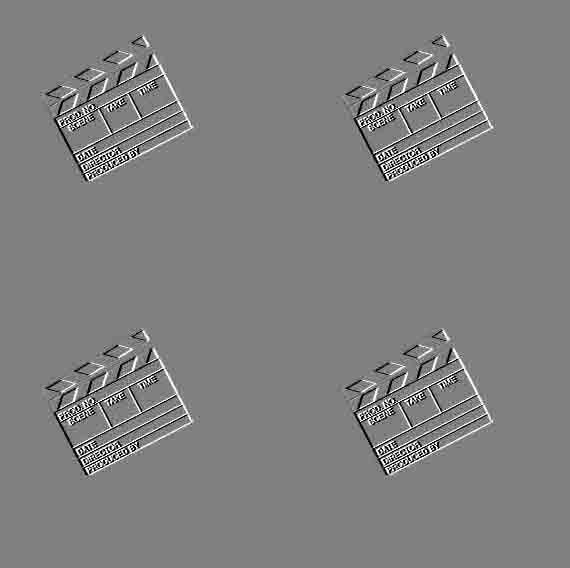 However put two actors in front of him speaking dialogue and he struggles. This is primarily Heath Ledgers film and he delivers on the promise he showed in films like 'Ten Thing's I Hate About You' and 'The Patriot'. He looks every inch a leading man for the future and this film will certainly not have damage his prospects. Shannyn Sossamon plays the love interest Jocelyn and acquits herself well in what is her debut feature. She is certainly a nice piece of window dressing and has a wide variety of modern style dresses to wear in the film. Another move (like the music) to give the film a bit of character outside of it's generic plot roots. One of her outfit's looks like something Jackie-O might have worn. In support you have Rufus Sewell as the by-the-numbers bad guy Count Adhemar. I like Sewell and I don't see enough of him for my liking, he has a very distinctive look that suit's the pantomime bad guy role to a tee. You also get my personal repellent Mark Addy as Williams squire, ugh. For money though star of the film is Paul Bettany as Williams herald and wannabe writer Geoffry Chaucer (a real life writer who wrote the 'Canterbury Tales). Bettany builds upon his stunning debut in Gangster No.1 to totally steal the show from all and sundry. His WWE style Joust announcements are the highlight of the film. It's a shame then that A Knight's Tale is just so predictable. As I said this story has been done to death time and time again. The latter parts of the film are so obvious that if I were to tell you what happens I wouldn't bother with a spoiler space. The events that transpire are so blatant that only a blind monkey who has never seen a film before would be surprised by what happens. Add to that an ending so cheesy and Hollywood that my stomach was turning. But, at the end of the day what do you want from a popcorn fodder summer movie? It's not here to challenge us intellectually or strike up political debate. It is merely there to entertain for the 132 minutes that it runs. And when the credits roll that is what you are, entertained. 5/10 for A Knight's Tale. Poster Quote - A bit of a tall tale.